That vow is one most of us would make. Keeping it, however, is another matter. Let’s consider some facts. What are the odds you will live the last years of your life in a skilled care facility (nursing or assisted living home)? About 14 percent of all people over age 64 have two to three chronic conditions that negate their ability to live independently. According to the U.S. Bureau of the Census as reported by Nursing Home Diaries, 5 percent of people over age 65 live in nursing or assisted living homes and 25 percent of them will spend some time in one. The chance of a stay in a nursing home increases 1.4 percent a year from age 65 on. Almost 50 percent of those over age 95 live in nursing homes. While staying in the comforting surroundings of our homes is what most of us would prefer, just saying so isn’t going to make it happen. Unless you have a written plan and the finances to carry out that plan, the chances are high you will not be able to afford living in your home once you need daily assistance of some type. The problem is that spending your last years in a nursing home is expensive, too. At rates of around $7,000 to $12,000 a month, it is very easy to spend $250,000 or more during the last years of one’s life. While this is doable if you have the money, it becomes a financial disaster if you have a spouse and spend through your estate in your last years. In this case, the first one to die wins at the expense of the survivor. According to the U.S. Census Bureau, 70 percent of Americans age 65 and over have a household net worth of just $344,870. If one spouse enters a skilled care facility there is a real threat that the other will run out of money to fund living expenses, relying only on Social Security. Once someone’s assets are spent down, Medicaid will begin paying for nursing home costs. This may mean changes such as moving to a facility that accepts Medicaid and out of a private room into a shared room. It also may mean waiting for a bed to become available. The “short version” of the law is that Medicaid begins paying once assets are spent down to $2000. However, there are provisions meant to protect the non-institutionalized spouse from destitution. 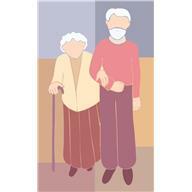 Some of the couple’s assets are exempt from being spent down for nursing home care. In South Dakota, for example, the spouse may keep half of the combined assets up to $119,220. Other exempt assets generally include personal possessions, one vehicle, equity up to $552,000 in the couple’s personal residence, prepaid funeral plans, and assets that are considered “inaccessible”. There are also limits on monthly income from pensions. The numbers above are for South Dakota; all of these limits vary by state so be sure to research your own state’s laws. Obviously, planning for long term care is vitally important, and it needs to be done well before the event that sends someone to a skilled care facility. Unfortunately, those events are often sudden and impossible to predict. The sad reality is that very few people plan ahead—even those who do financial planning in other areas. Many elders have a deep resistance to doing end-of-life planning. That is sad, because the less planning you do, the more limited your options become.